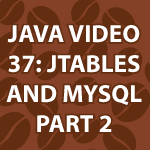 In this part of my Java Video Tutorial, I continue showing how to use JTables with MySQL. You’ll learn how to pull information from a database, add a row, delete a row, convert a String into a SQL Date and much more. If you haven’t seen my Java Swing Tutorial watch it first. Part 1 of my Java JTable Tutorial should also be seen first. I explain how to load the database below. I also have all of the code. Use your USERID and PASSWORD. Point to the locations for where you saved the files above. That’s it. i love your teaching style ,Thanks for the tutorial. Thank you so much for your tutorials. They are so far the best of all java tutorials I’ve seen on youtube. It would be nice to extend tutorial #36 and 37 to sorting and filtering of jTable. Is sorting and filtering possible with DefaultTableModel? Thank you very much for your tutorials, helped me a lot on my school projects, keep up the good work ! Your code is working correctly. I just want to mention something; (I am not sure whether it is good) but here it is. Once you have imported JFrame(line 16) , and created new JFrame (line 67), Then you don’t need to extends your class by JFrame (line 24). thank your teacher your effort. i like to say you thanks very much. Thank you so much for these tutorials. As an aspiring Java developer/student, I am interested in creating Java-based applications that interface with relational databases.. Instead of hard coding the columns, i decided to use a metadata from the previous tutorial. However, i keep getting “Exception in thread “main” java.lang.ArrayIndexOutOfBoundsException: 4:” error. the console prints numbers 1-3. You’re right about things clicking. I’ve been working on Java really hard and suddenly going back to PHP and JS things seem a lot clearer in my head. I’m experimenting with my own database at the mo and was wondering.. What is the purpose of overriding the getColumnClass method? – Why a zero (0) in getValueAt(0, column)of overidden method getColumnClass(Lesson 37)? Also, job well done on (all that I have viewed so far) video tutorials. The video format works well with me. The explanation, timing and focus of the lessons and key points are cohesive. You also have a good way of conveying them. This is a great tutorial, but iI’m having trouble getting the data from mysql. I’m using MAMP. Do I need to change something on the connection url or to MAMP’s configurations? Because I keep on getting “SQLException: Communications link failure” on the console. How about inserting values in to the same database. Yeah, I’m wondering how to do that too 🙂 Great turtorial, I love this guy! Thank you for the awesome tutorial and assistance. I’m having trouble adding a president because each time I do so the month ends up being October, the day is always the first, and the year always increments by one then what I inputted. Is there any reason why this is happening? Sorry, but I’m not sure. It sounds like you have auto increment set up on some data. Remove those and everything should be ok. Thank you for the great tutorials also. So far so good. You need to create the database first. That should fix that issue.